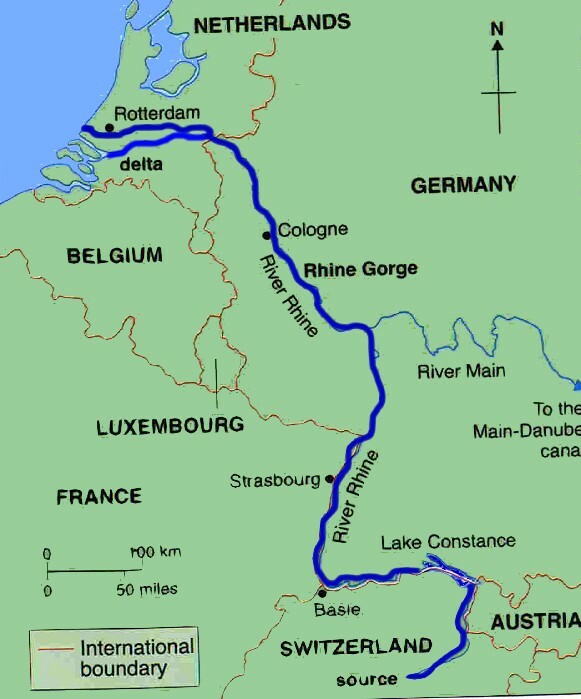 The Rhine is one of the longest and most important river in Europe. It runs for over 1,232 km (766 mi) from its source in the in the Swiss Alps (in Switzerland), issuing from the Rheinwaldhorn Glacier 3,353m above sea level. The Rhine flows through six countries -Switzerland, Principality of Liechtenstein, Austria, Germany, France and the Netherlands before flowing into the North Sea at Rotterdam. The Rhine begins as a small stream in the Swiss Alps but soon gathers speed and volume on its way to Lake Constance, a source of drinking water for large parts of southern Germany. As it continues on its way to the North sea, the Rhine flows over the famous Rhine Falls at Schaffhausen and through the industrial town of Basel. There it becomes is a major transport route through Europe; transporting goods and raw materials by ship. It is now a wide river. As the Rhine enters Germany it becomes the border between Germany and France. Through the Rhine Gourge the landscape changes again as the river narrows to form a steep sided-valley filled with vineyards and castles overlooking the river. Finally the Rhine reaches the Netherlands , a completely flat country, where it joins several other rivers on its final journey to Rotterdam and the sea. The River Rhine is called different names depending on the country it flows through. It is called Rhein in Germany; Rhine in France and Rijn in Netherlands. Many years ago, the Rhine was considered as one of the most polluted rivers in Europe. In 1986 the river was severely polluted by a chemical factory fire (Chemical spill turns Rhine Red - BBC News 1986 ). Within 10 days the pollution had travelled the length of the Rhine and into the North Sea. After the Chemical spill in 1986 the Rhine Action Programme (RAP) was developed, and adopted by all the countries bordering the Rhine. By the year 2000, the programme aims to achieve a return to the river species such as the salmon which once thrived there. The use of the river for extracting drinking water is also safeguarded.